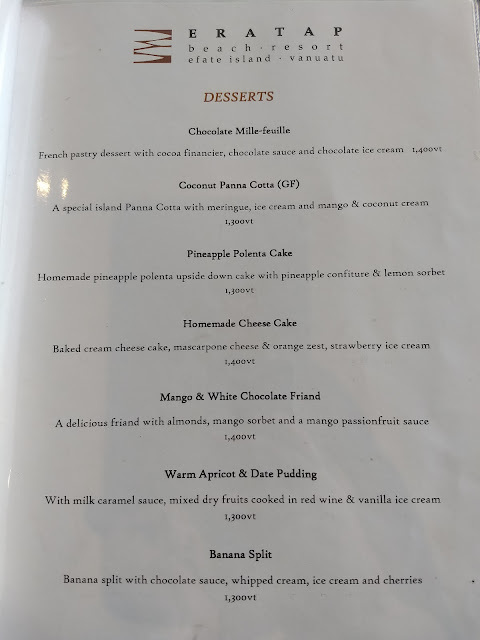 I have recently returned from a week long holiday in Vanuatu and I am happy to report that the food scene, from my experience is the best in the South Pacific. Now I hear you saying that the South Pacific has a very poor reputation for it's cuisine and at times I would tend to agree. It suffers from the isolation and therefore importation process which is a surefire way to guarantee old produce but Vanuatu has a number of things going for it. The main island of Efate has more land than many South Pacific islands which they use to produce some on their own produce, including beef which we were surprised to see grazing around the island and they take advantage of the abundance of the seas surrounding them to supply fresh seafood. I took so many pictures of food and menus that I realised this post would be the length of War and Peace so instead I will do a series of posts all under the heading Eat Vanuatu. This is the first installment of that series. 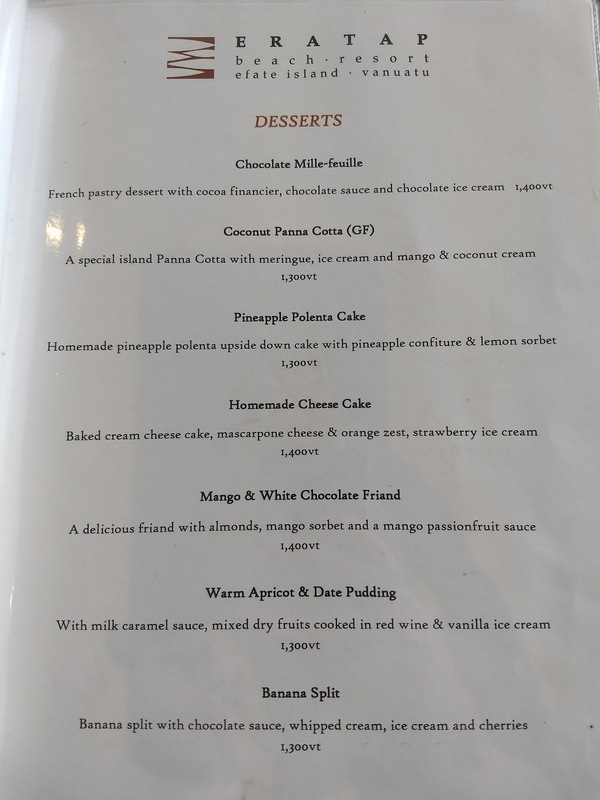 First thing I will put out there is that it isn't cheap to eat in Vanuatu, if you are used to holidaying in Asia you will need to up your budget for Vanuatu, food prices due to the importation of food is an issue across the whole of the South Pacific but it certainly isn't outrageous. Average prices would be $15-$25 for an entree and $25-$40 for a main (unless you go for the seafood platters or lobster). 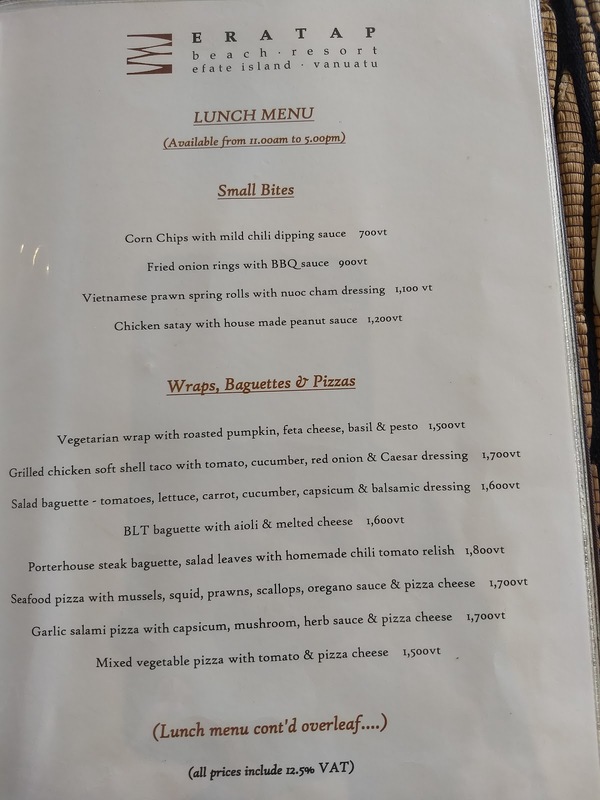 For these prices we found average food, good food and really good food. 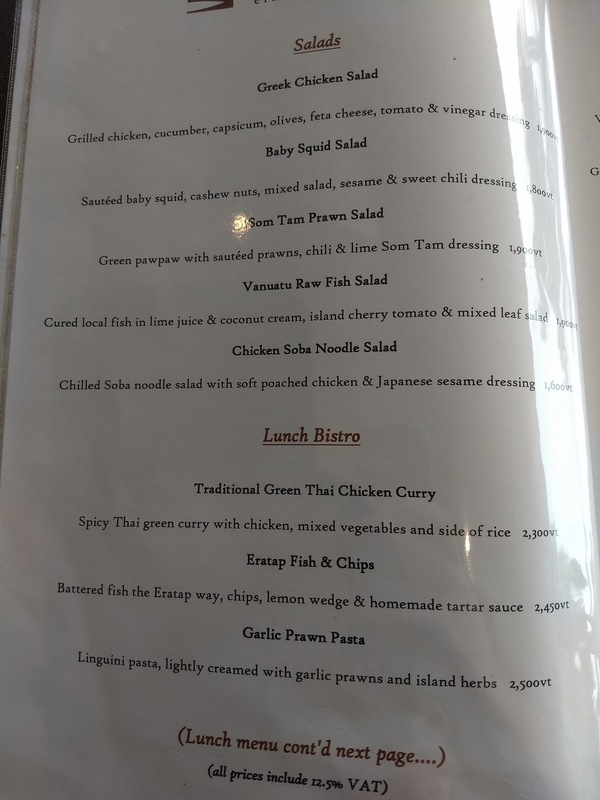 The prices didn't seem to vary with the quality of the resort or restaurant or the quality of the food. So a little unusual in that respect but all the more reason to ensure you have chosen well. 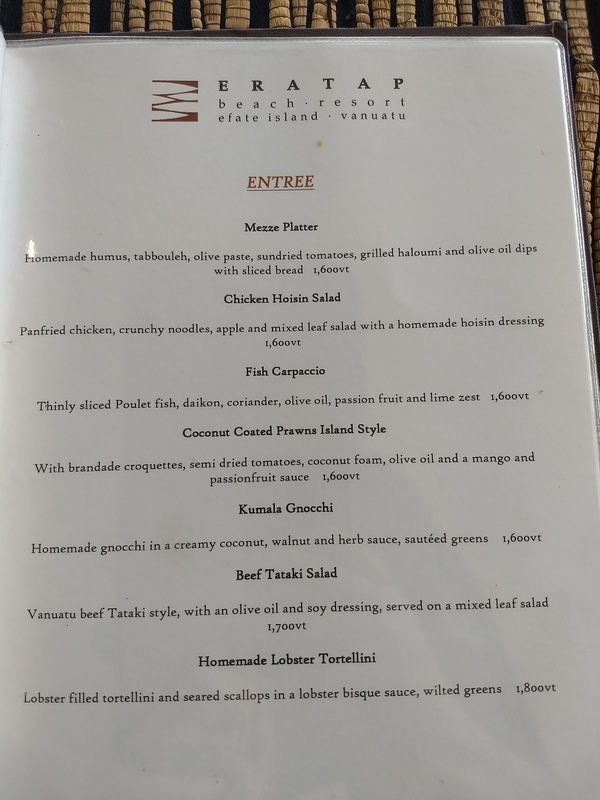 There are more than forty restaurants on the main island of Efate and it is an ever changing scene. This information is based on May 2017 and will give you a good grounding on what to expect and some favorites of mine. So I am going to start with the show stopper, the meal to end all meals. 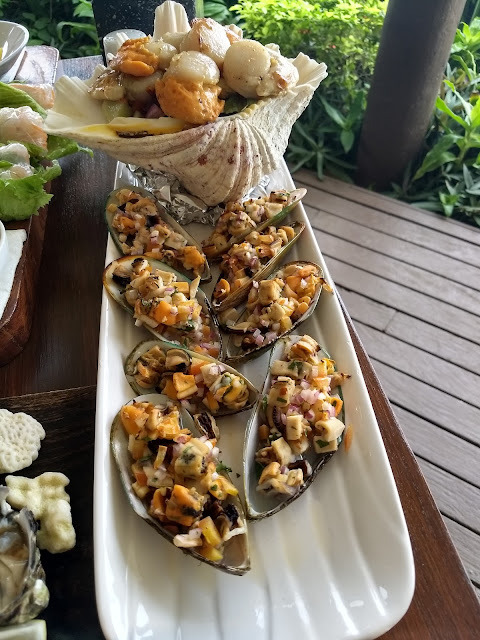 The seafood platter at Eratap Beach Resort. When choosing a seafood platter on Efate you are spoilt for choice. I did my research before travelling as I did not want to waste money on battered and fried seafood. 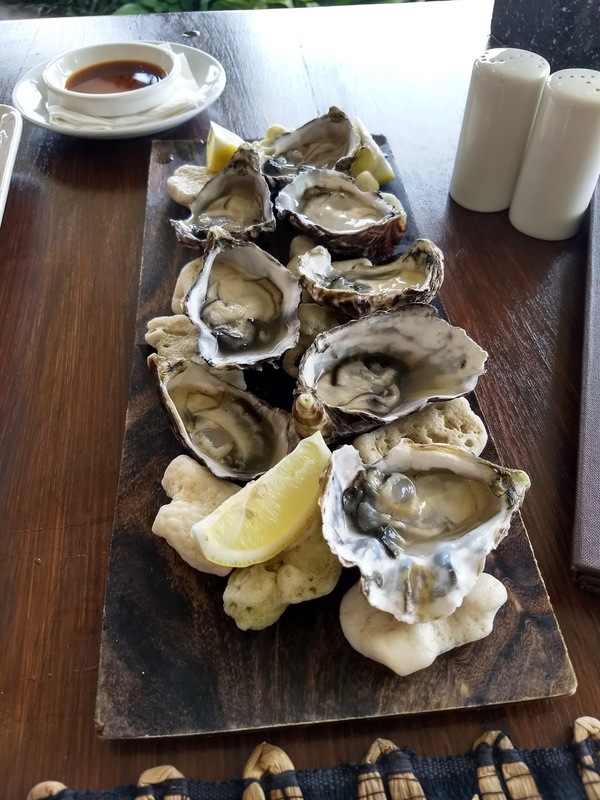 I like my seafood fresh and often raw. 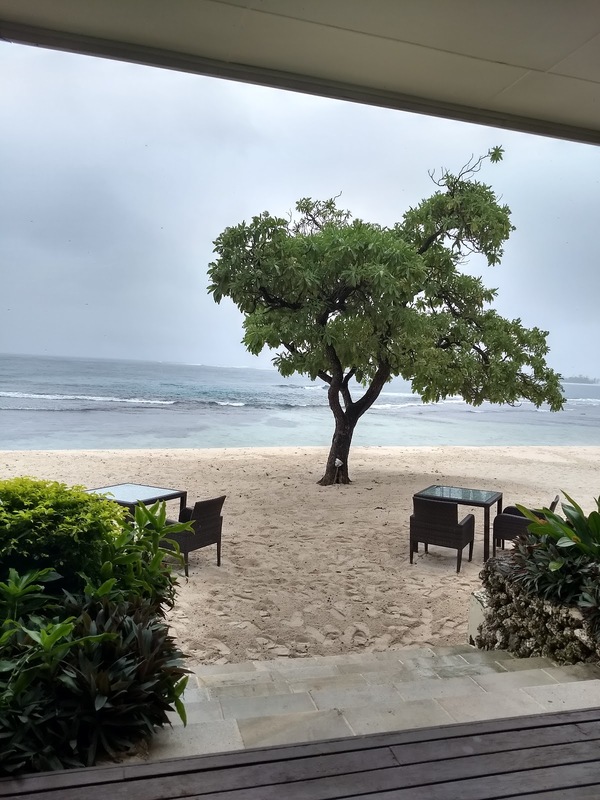 Eratap is located around a forty minute drive from Port Vila. It is down a long pot-holed dirt road which gives it a feeling of isolation. You can reach the resort via a local bus which will cost you 300 vatu each way or you can drive yourself if you have a hire car (4WD recommended). You do need to order the platter 24 hours in advance. 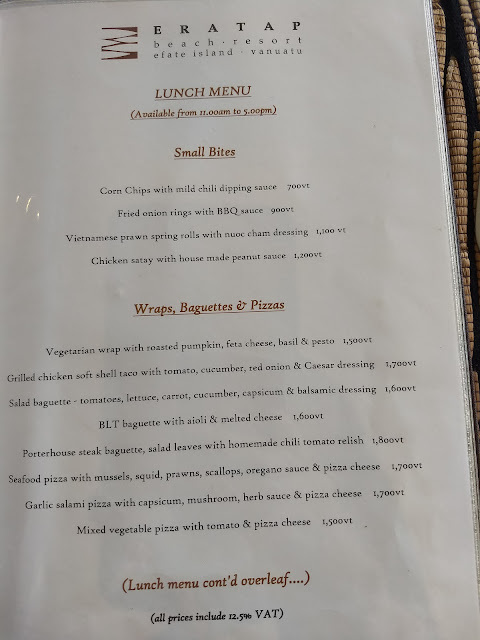 We had it for lunch as we didn't want to navigate the poor roads at night and we were informed that it was rare to be ordered for lunch and is normally reserved for dinner (my guess is due to the cost). 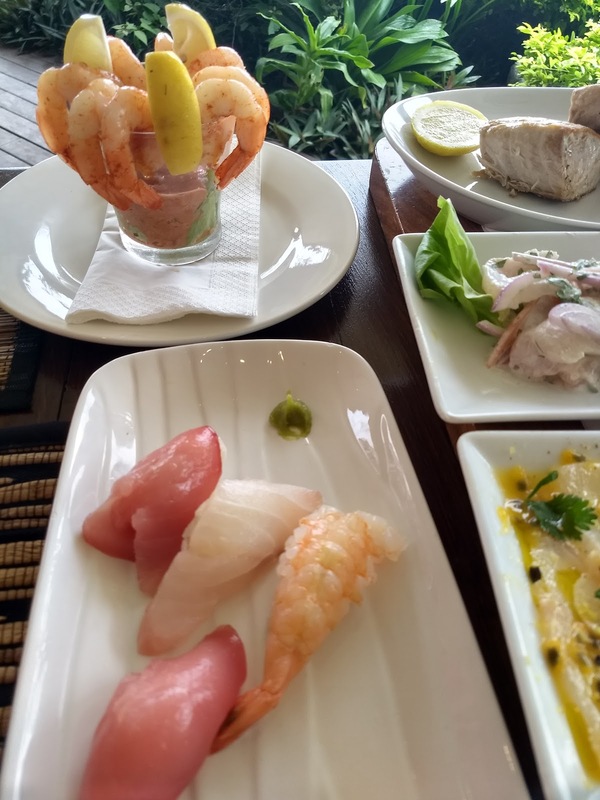 It is worth noting that this two person seafood platter priced at 120 000 vatu is on par if not cheaper than many of the platters on the island and from what I saw of a much higher standard. The other main point worth noting is that the name of this is a lie. This is not a platter. This is a table full of platters. An eye watering quantity of food that we couldn't quite finish and we are big eaters. 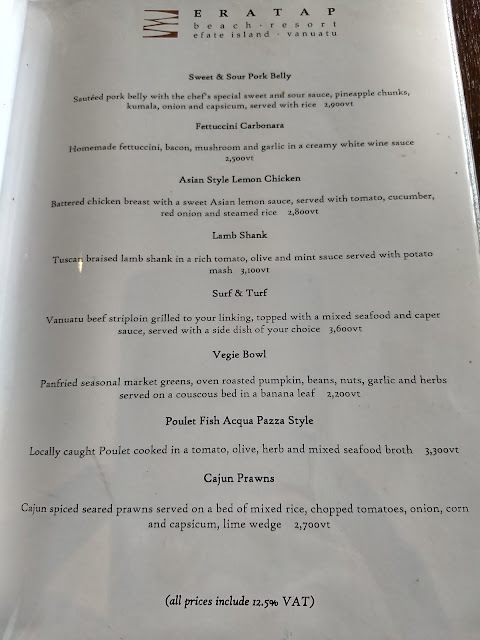 I have taken pictures below of all of the dishes. The absolute highlight was the Nigiri especially the yellow fin tuna which was unlike any other Nigiri I have tasted. 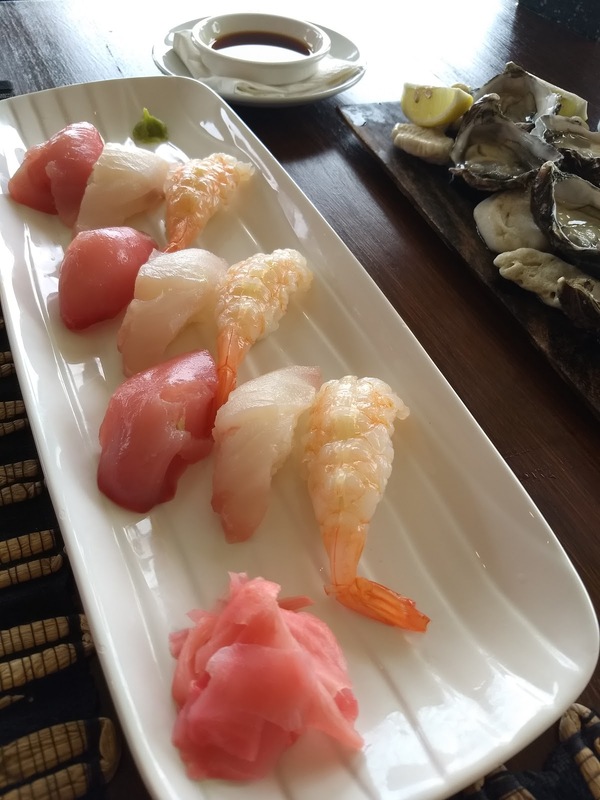 The selection of seafood in the Nigiri was nice and the very subtle smear of wasabi and bowl of soy was the perfect accompaniment to such delicate seafood. 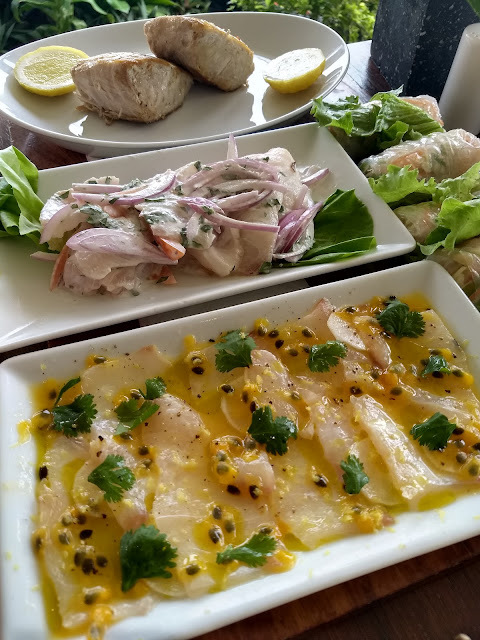 There were two other raw fish dishes one paired with passion-fruit which was an interesting twist as I haven't had fruit with sashimi before and the other with a South Pacific style coconut milk dressing. The scallops in a greek style salad were the husbands favourite as the scallops were so tender, just lightly cooked as to not affect their texture. The prawn cocktail looked like a retro inclusion in such a modern platter but the sauce was a more modern version with paprika and lemon. The mussels were an interesting presentation where they had been chopped and cooked and mixed with raw onion and tomato, they had potential but the mussels were a touch overcooked. 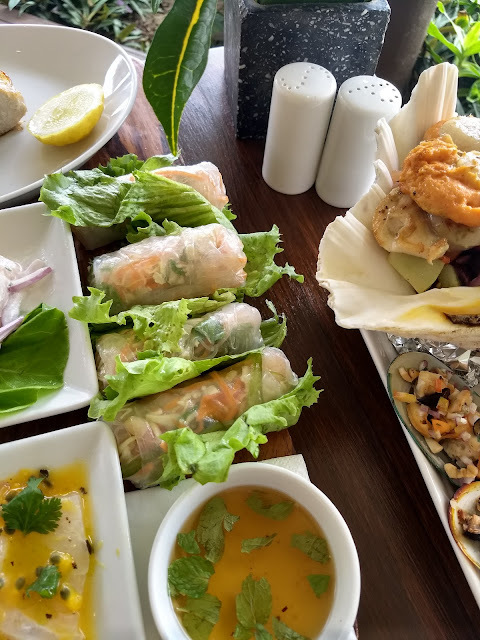 There were also Vietnamese style rice paper rolls with a lovely tart dipping sauce. I liked the crunch and texture in the rolls created by chopped nuts. 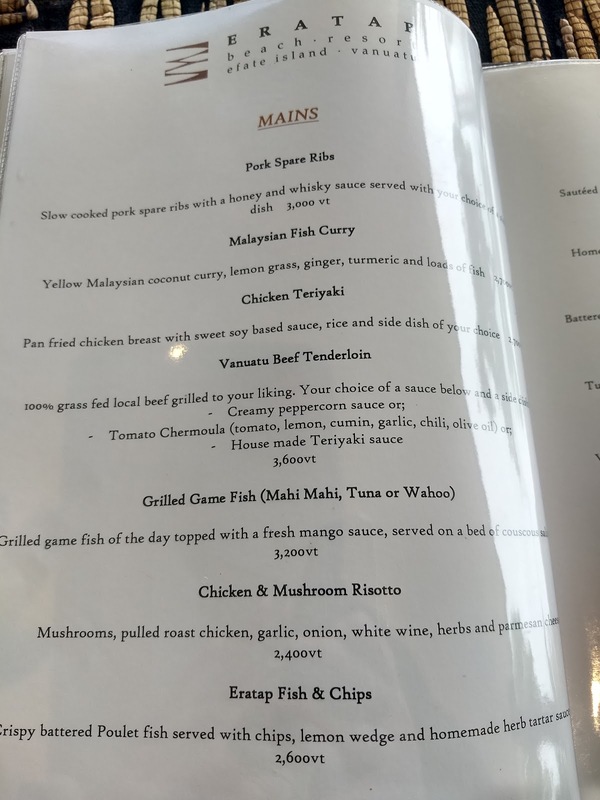 There was also a fillet each of grilled poulet, the local fish which was perfectly cooked and only needed a drizzle of lemon. It truly was a feast, it ticked all the boxes for me, we left completely impressed and stuffed to the gills. 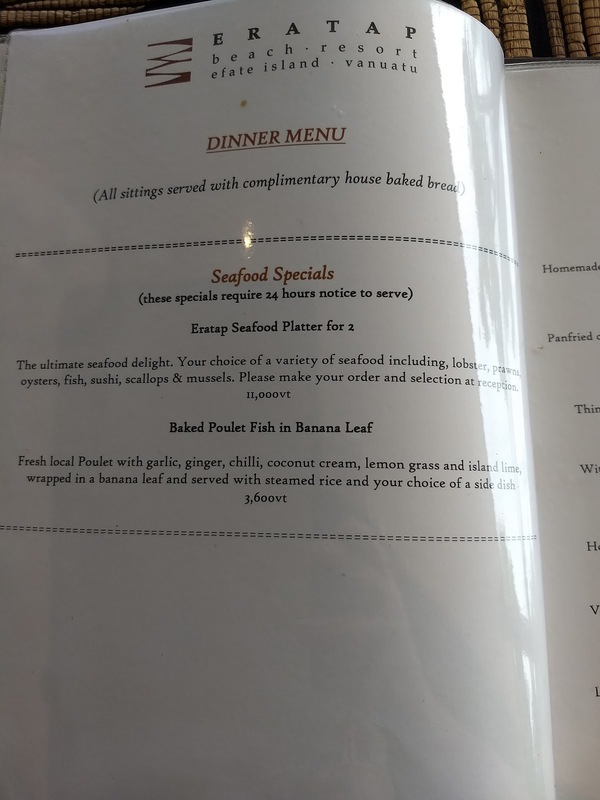 It was a shame the lobster was out of stock but we knew that when we made the booking and we were supplied with additional extras to make up for it. I would not recommend this for anyone who doesn't like raw seafood as at least 50% of this platter was raw, if you aren't sure if you like raw seafood then this is a great way to dive in and if you are a raw seafood lover like me well this will take you to heaven. The rest of the menu at Eratap was not badly priced at all, had a huge variety of dishes and the beach front setting was magical. We had the whole restaurant to ourselves for most of our lunch, I believe it is busier at dinner when resort guests are back from day trips. I would highly recommend that it is worth the drive out here for lunch or dinner. Be sure to call ahead though as they keep a majority of tables for guests of the resort and it is a small venue. Here is a selection of photos to show the platters as well as the menu itself. Wonderful. 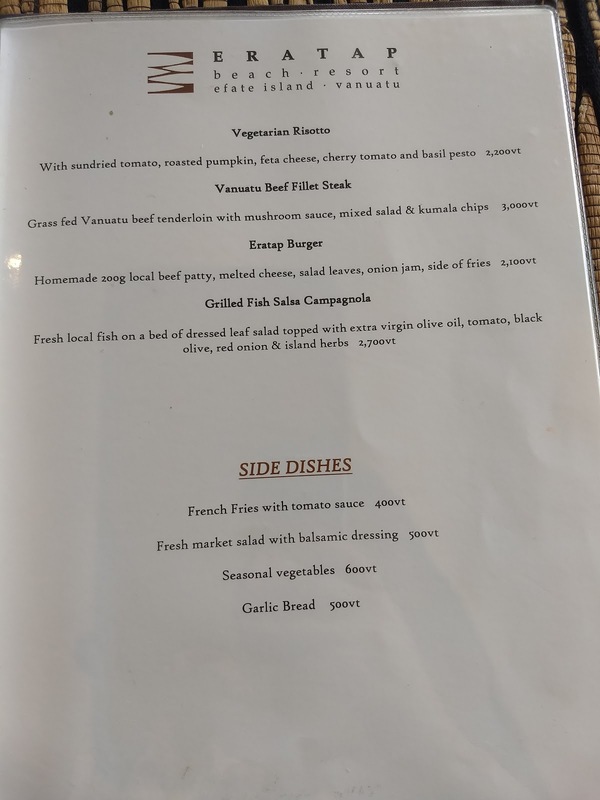 A beautiful meal and what an amazing menu. It makes me wonder who they have cooking there.